Permeability is a complex quantity that is frequency dependent and any analysis that pretends otherwise is not soundly based. 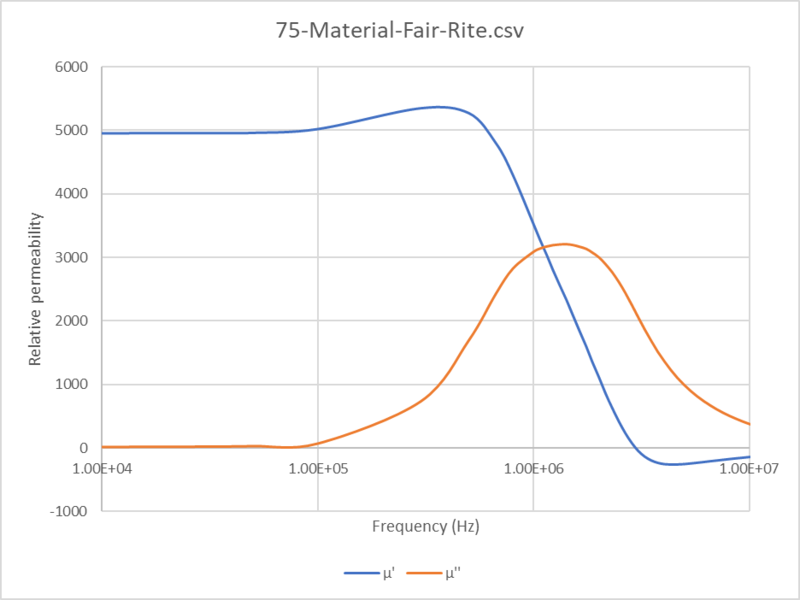 Above is a plot of Fair-rite’s published permeability complex data for #75. 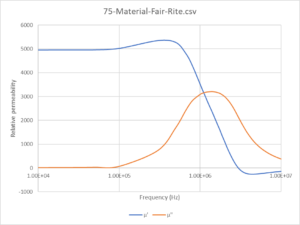 Note the rapid descent of the real component µ’ to zero, a strong sign of dimensional resonance in the measured core. Dimensional resonance is a function of cross section dimensions and larger cores may have dimensional resonance evident well below 1MHz. The chosen small binocular #43 cores do not exhibit dimensional resonance in the frequency range of interest, the windings are a practical number of turns, the performance is predicted by a simple model, and the measured performance documented in the article reconciles well with the predictive model. Previous Previous post: Feasibility study – loop in ground for rx only on low HF – SDR for measurement?